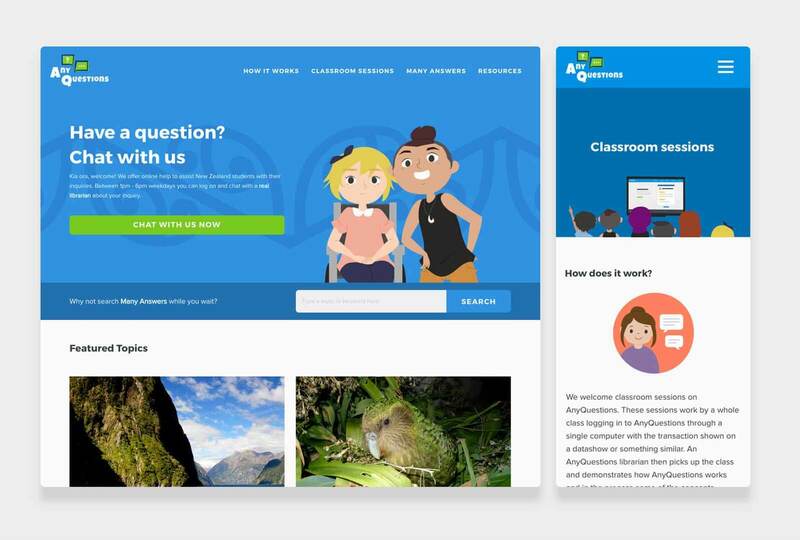 AnyQuestions offers free online schoolwork help for kiwi school students. The multi-award winning site lets kids chat online with librarians who help the students find and recognise reliable sources of information, building vital information literacy skills. The National Library already had an AnyQuestions website. However they knew they needed a tool that school-age children would actively want to use so they asked Boost to design and develop a new site. By focussing closely on understanding and meeting the needs of schoolkids, the site has seen usage jump by 74%. To make chatting a seamless experience we also embedded a new Software as a Service (SaaS) LiveChat tool. The great relationship we developed with the LiveChat team led to them giving us a beta version of an embeddable LiveChat widget, saving considerable time and money. We clearly saw the connection the students feel with the site during our user testing. When we were showing a prototype to a group of schoolkids a young boy pointed to one of the characters. “That’s me!” he said.